The Jesus Book is a delightful book for children. The book is the Who, What, Where, When, and Why of the life of Jesus. It tells the story of Jesus in simple stories and beautiful, bright illustrations. This is a must have for the 4 to 8 year old crowd. It also comes with an hour long CD filled with wonderful kid's bible songs, which I really loved. The book and CD would make a wonderful gift for the little ones in your life. All children have questions about Jesus, especially younger kids who are exploring the world around them and are full of curiosity. Jesus is such a huge person to understand and I love that this book brings His story to a level easy for children to comprehend. The stories within the book are well told, teach about His life and what he did for us, as well as teaching valuable life lessons. The illustrations are bright, cheerful, and children are instantly drawn to them. I've spent many an hour looking for the "perfect" children's book about Jesus, and so wish I had found this early. 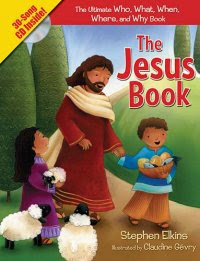 I highly recommend this book to those want to share the story of Jesus with their little ones. The adults will be thrilled with the quality of writing and illustrations, and the kids will love it! You can flip through the book online by clicking here.